All I have to say is I've taken a ton of whippers on a sliding x, on dyneema, spectra and nylon, and I've never seen any evidence of any excess heat/wear on my runners. More importantly, it's never failed. And I can tell if it's set up right with a simple glance. Not saying the sliding double x doesn't have merit, but I'll never use it. ... or, when you climb on crappy placements, set up gear for a multi-directional load on a traverse. And, yes, as you say multi-piych. Or really any route that wanders. Do you need me to explain these further? That rig is used for much more than TR anchors. Not for u top rope tough guy. Wow, your ignorance is amazing. You are one of those guys who use cams in nut placements and doesn't even know it. You are hereby awarded two style points for making up a climbing-based insult. .. so whippers DO happen. Indeed. However, I’m sure that you understand why the claim to have taken a ton of whippers on this type of anchor may appear a bit inflated to many of us mortals. The sliding X does come in handy as a progression anchor in specific circumstances but it’s the kind of rig that you want to avoid if you can since it takes longer to set up than a one-piece anchor. Maybe it’s simply a case of different interpretations of how many whippers make up a ton. Mmmh… , looking at it this way and given my own aversion for whippers in general and especially those on dicey pro or involving a pendulum, I’m not sure that I would not put as few as a couple of them in a ton myself. I doubt that the clutch effect by itself would result in visible wear on the sling after a whipper on a sliding X. That is probably why it took until the Long/Gaines/Ewing tests to realize that this rig was less effective than commonly assumed for equalizing two pieces using a single sling with two arms of different lengths. Since equalization is the main purpose of this rig, I would heartily recommend reading the test reports in the Long/Gaines book to anyone using the sliding X for belays, TR or as progression anchors. To be clear, the book does not recommend not using the sliding X, far from it, but it does point out a number of things about it that are well-worth knowing. 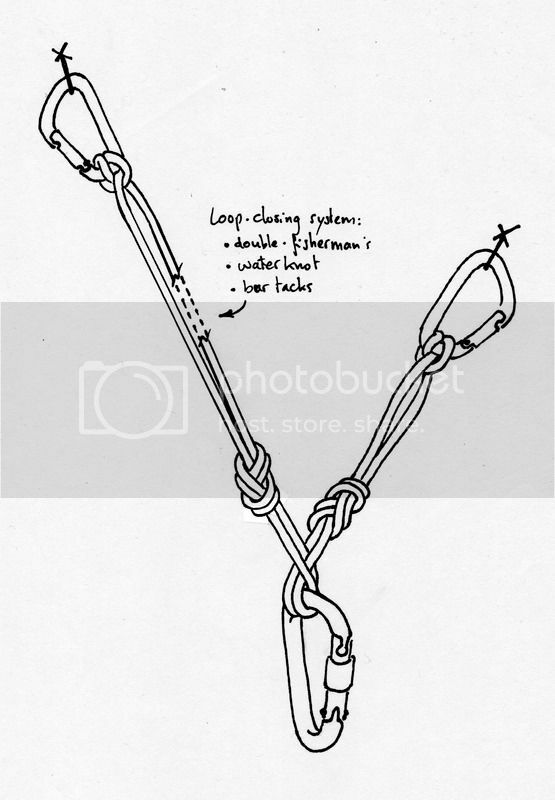 One thing I've noticed when people tie sliding X with limiter knots is that the knots are usually much closer to the anchors than they need to be. A quick rule about where to tie the knots is to tie them the distance between the two anchor points apart and centred in the webbing/cord that you are using. This gives you a complete 360 degree range of equalization with the smallest amount of possible extension if one leg fails. Since you probably won't be using 360 degrees of pull, it's usually okay to ballpark it on the conservative side. You're being successfully trolled by the most obvious and persistent troll currently on this website. 6 years later thread resurrection! Having recently realized that the link to sittingduck's illustration was no longer active, I thought I'd draw one myself. While I was at it, I included the "usual trimmings" I use for a sliding double-X anchor: cloves on the pros for added redundancy and extension-limiting fig8s narrowly centered around the central point with a bit more room on the side of the longer arm because that is where the cordage must come from to equalize the reduced stretch of the shorter arm.